New Tangle Teezer is a revolutionary hairdressing innovation by celebrity colourist Shaun P and is unlike anything else currently available on the market. As it's name suggests it is great at easing through tangled hair ! Suitable for all hair types that are prone to tangling (wet or dry hair). Detangles long, knotty wet hair super quickly. Untangling natural afro hair after taking out single plaits, cornrows or hair extensions wefts becomes less of a chore using the tangle teezer. Washing relaxer afro hair. Daily brushing is simplified. Glides through European, and Asian hair textures. Untangles hair extensions of all types (real, synthetic) and wigs. Is effective on coarse, curly and fine hair prone to knotting. 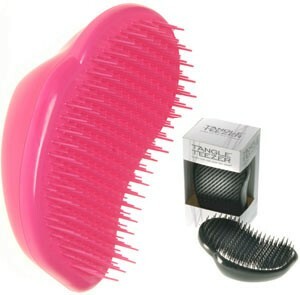 Achieves the most amazing backcombing effect. Kids absolutely love it !! !